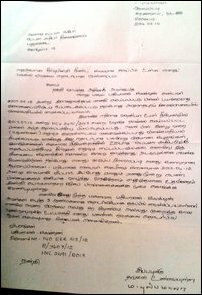 Tamil prisoners are now forced to direct their struggle demanding justice from the Office of the High Commissioner of Human Rights, the prisoner further said. “We were initially directing our struggle against both the Sri Lankan President Maithiripala Sirisena and the SL Prime Minister Ranil Wickramasinghe, who have been reiterating that there were no political prisoners in the prisons,” he told TamilNet. “Tamil parliamentarians such as M.A. Sumanthiran have also gone on record stating that there was no one inside the prisons without a valid reason. But, this is not the truth,” he further said. Sulaxan hails from Kara’navaay North in Vadamaraadchi, Jaffna. His mother, when contacted by journalists, categorically stated that there was no case against her son in the courts. She provided the copy of an appeal that she had sent to SL Attorney General on 16 February. Sulaxan’s father, Azhvaappillay Mathiyarasan, who was an elected civic member in the local council, passed away after illness last year. He was struggling to get his son freed. There was a case filed against Sulaxan at the High Court in Vavuniyaa on 23 July 2013. The case was later withdrawn. But, Mr Sulaxan was being detained despite there was no charge against him. The Attorney General of Sri Lanka was repeatedly urged by the mother through the court to consider releasing her son. But, there has been no positive response, according to Sulaxan’s mother M. Pushpamala, who is struggling to look after her three daughters without her husband and son. The Tamil prisoners of war and the detained political prisoners have been waging several hunger strikes in the recent months.